Structural fire engineering is a discipline for large or complex buildings that considers the performance of structures when exposed to a heating load. This allows engineers to design structures (and applied fire protection) to achieve pre-specified performance. In addition, when structural engineering and fire protection in buildings are assessed together, it is possible to demonstrate structural robustness, bring about efficiencies in design as well as provide considerable cost savings. The past two decades have seen great advances in the understanding of structural steel’s behaviour in fire as a result of extensive small- and large-scale physical testing. There are now numerous cost-effective ways of engineering a steel structure to meet the regulations. Building Regulations state that the stability of a building must be maintained for a reasonable period. We have to interpret what this means, says WSP technical director Mark O’Connor, whose firm provided structural and structural fire engineering services for the Shard in London. For the Shard, the rule book didn’t apply so we had to demonstrate how the building would perform in a fire. The approach looked at the building and the elements which make it up. The 310m-tall Shard is a 95-storey mixed-use structure (72 floors occupiable) and is currently the tallest building in Europe. Levels 1 to 41 are composite steel deck, levels 42 to 72 are reinforced concrete and the remainder comprise the steel spire. To ensure the efficient integration of passive fire protection, structural engineer WSP also provided fire engineering services. Fire is a significant safety issue in any building but especially so in tall towers. The taller the building, the longer it takes for occupants to escape. It also becomes more difficult for firefighters to tackle a fire. Since the Shard is both tall and mixed-use, many scenarios regarding the fire response of different structural arrangements and materials had to be considered. For example, the structure of an atrium differs from that of an office floor due to its different loadings and spans. They will also act very differently in a fire due to the size of members. In fire engineering terms, the areas will also be considered to pose different fire risks; the lobby area enclosed by an atrium will be less densely populated and with a smaller fire ‘load’ (anything which could contribute to a fire such as paper or electrical equipment) than an office floor, so each will require different approaches for fire survival. Large-scale structural fire engineering, such as that seen on the Shard, considers the different scenarios which contribute to a range of possible intensities and durations of fire. These scenarios are analysed using finite element modelling software that has been validated against the findings of the large-scale fire tests carried out at Cardington, Bedfordshire between 1994 and 2003. These physical tests involved monitoring the effects of fire on an eight-storey steel-framed building with composite steel deck floors. Structural fire protection is considered the last line of defence, says Dr O’Connor, himself a structural engineer specialising in fire engineering, and only becomes important if other strategies, such as the use of active fire protection – that is, sprinklers – or rapid intervention on the part of the fire brigade, fail. Understanding how critical each element is in terms of the building’s overall structural stability, and how these elements interact, is the key to the structural fire resistance strategy. Structural fire engineers can take advantage of enhancements made to the structure to deal with other events such as disproportionate collapse when it comes to considering how the structure will perform in a fire. He adds that Building Regulations treat every element in a building the same way and do not take into account how critical an element is within a structure. On the Shard, simply applying fire protection to a large transfer structure would have been sufficient to meet the requirements of Approved Document B for structural stability but where the complex interaction of that element of construction with the rest of the building required computer modelling to prove how it would perform in a fire and how much protection was required to ensure that it was safe in a fire. Dr O’Connor adds that on the Shard, fire protection is enhanced on certain structural elements to ensure that they never fail, whereas elements less critical to the overall stability can have reduced levels of fire protection. 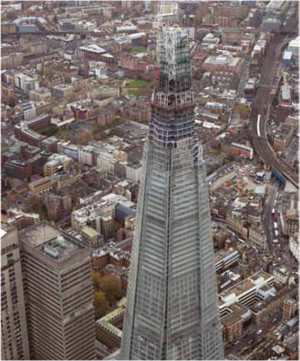 Applying fire protection in this strategic way, particularly for a large building such as the Shard, has significant cost benefits. For a building of this size and nature, it was important to consider a range of approaches to ensure that the fire protection specified met the requirements of all stakeholders, while ensuring an added level of confidence that the structural fire performance of the building would be acceptable under the expected range of fire scenarios, says Dr. O’Connor. An assessment of fire loading, ventilation and likely temperatures were made and applied to a computer model of the structure to determine which elements needed applied fire protection to meet the required stability and stress criteria. Off-site intumescent coating protection to selected members. Steelwork contractor Severfield- Rowen (now Severfield plc) assisted in proposing the most economic scheme where, for example, larger section sizes would require a thinner coat of the intumescent. It was found that concrete-filled fabricated steel box sections made from 100 to 125 mm-thick plate only required a thin layer of intumescent coating since the members had a significant degree of inherent fire performance due to their size and location. Since these A-frame steel elements respond differently in a fire to a single beam or column, computer modelling revealed that they needed greater protection than prescribed in Approved Document B. The transfer structure A-frames were encased in board.